Dubai, UAE, June 12, 2018: Sleek and light, Lacoste Moon watches for him and her are the result of an exercise in style based on the timeless design, bringing time down to the essential. This new collection is inspired by the sobriety of bygone days: round shape, slim case and minimalist dial with the signature crocodile at three o'clock. 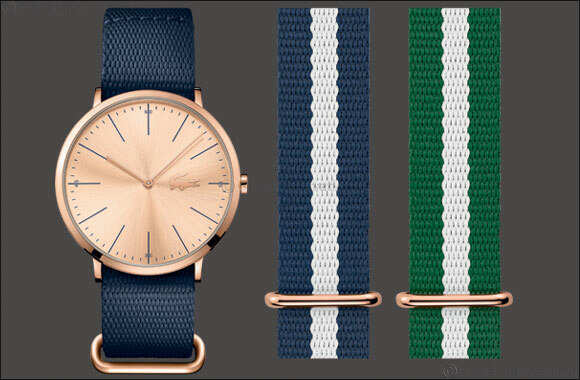 The Moon Unisex Gift Set with 2 Complimentary NATO Straps. Its super-slim case unites comfort and elegance to match the lifestyles of today with vibrant mix of work and play. It’s always time to shine. The watches are available at Hour Choice stores across the UAE and are priced at AED 965.